Before buying your favorite natural stone tile, look at as many pieces as possible to get comfortable with the natural variation (colour, grain, texture) of the product. 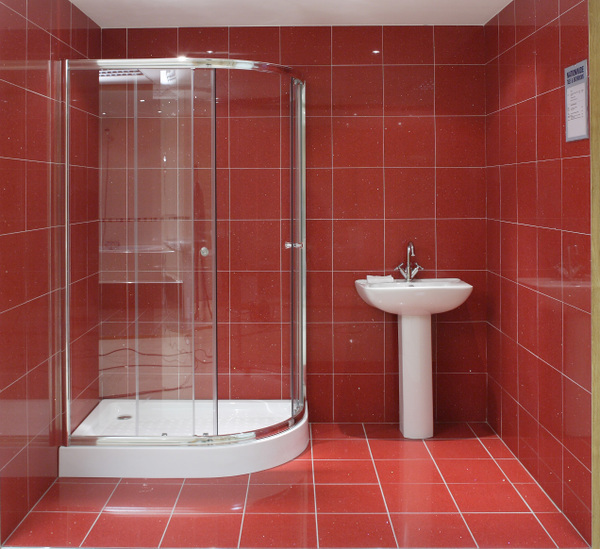 Measure the area to be tiled as accurately as possible allowing an extra 5-10% for cutting and possible breakages. Prices for stone tiles and pavers are usually quoted on a square metre basis; often the price quoted includes the area taken up by a nominal 10mm grout joint. If smaller grout lines are preferred an adjustment to the covered area will need to be made. If in doubt, seek advice from your friendly tiler. Calibrated (similar thickness) stone costs a little more but requires less preparatory work and uses less adhesive; it is therefore quicker, easier and cheaper to lay. Natural split material will be variable in thickness so it requires grading – sorting into similar thicknesses before fixing commences. The thickest tiles dictate the floor level and should be installed first; the thinner tiles will require building up with more “mud” or adhesive to achieve the right level. Its quite normal for hand split stone to have some flakes or loose layers – these are easily removed with a paint scraper prior to laying. Broken pieces, if any, should be kept and put aside to be used for cutting to minimize wastage. Remove surface dust on the tiles prior to laying by sweeping with a dry broom head or if outside, giving the stones a light hosing. Bond breaking or bond inhibiting contaminants often penetrate the substrate’s pores and block the adhesive’s efforts at establishing a bond. One of the best ways of removing these contaminants is by mechanical abrasion. Renovating old buildings is often much more of a challenge because less is known about the substrate structure and previous treatments, so seeking professional advice is really important. Here are a few tips for different substrates each of which require specialized adhesive products. Concrete - smooth concrete surfaces may require additional preparation such as a light acid wash or latex primer to achieve better contact with the adhesive. Old concrete surfaces should be sanded or roughened using an impact hammer or machine blasting. Cement and sand screeds if used should have at least 3 weeks drying time before tiling. Concrete substrates have had 6 weeks drying time after curing before screeding, rendering or tiling. Cement and sand rendered substrates should have 2 weeks drying time before tiling commences. Cork , vinyl or ceramic tiles - fixing on floors already laid with ceramic, vinyl or cork tiles should work well providing the tiles are stuck fast to the substrate with no “drummy” sounds. If in doubt remove the existing surface before fixing. Fibro sheeting - fixing onto fibro sheeting requires a latex primer to be painted onto the surface. For tiling floors check the base make the required accuracy of finish can be achieved by laying a 2 metre straightedge on the surface to ensure there is no more than 3mm variation for adhesives. If floors and walls are out of plumb by more than 3mm, thickset adhesives should be used. 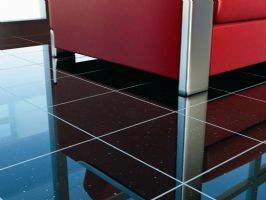 For floors where a fall is required – check that the substrate has the correct fall before tiling; if it doesn’t establish a datum level for the finished floor and control its level with a series of spot checks. The installation or laying of stone tiles is called fixing. This is usually commenced by setting out the tiling from the centre of the room or area in parallel lines to the perimeter axes. Avoid cutting tiles if possible but if it is unavoidable locate the cut tiles where they will be least noticeable. Ensure movement joints are correctly positioned. Adhesive installation is usually only recommended for stone 6 -12mm thick. Use properly formulated adhesives that have been designed to perform with stone for maximum strength and durability – seek professional advice on the most appropriate adhesive for your job before starting. Apply the adhesive to the thickness recommended by the manufacturer on the label – not more, nor less. Thin bed adhesives should not normally be more than 3mm thick whereas thick bed adhesives are spread 6mm thick or sometimes up to 12mm thick in isolated areas to achieve an even tiled surface. Do not wet background surfaces or tiles when fixing with any adhesive product. When fixing tiles on vertical surfaces ensure that there is 100% coverage of mortar to the background surface. The “open time” for adhesives to achieve maximum effectiveness should be stated on the label or packet; it is usually 20-30 minutes, not more. If the surface of the adhesive dries or forms a skin before tiles have been fixed, it should be replaced. If the adhesive has inadequate plasticity it will be incapable of achieving a proper seal predisposing the project to moisture penetration and possible failure. Don’t get “gung-ho” and lay too many tiles at once. Its best to lay 2-3 rows of tiles at a time – this will allow sufficient time to correct any mistakes and ensure joints are clean and ready for grouting. There are two methods of spreading adhesives – notch trowelling and buttering the choice of which depends on the need to prevent moisture penetration into voids behind the tiles. Notch trowelling is used for tiling on internal walls - surfaces where moisture penetration is not an issue. The technique involves spreading a thin bed adhesive on the background (to the recommended thickness) then ribbing the surface in one direction with a notch trowel. Tiles should then be pressed into position using a twisting, sliding motion then gently but firmly tapped. Thick bed adhesives should not be notch trowelled unless required to do so by the instructions on the label. For external surfaces or internal surfaces where it is vital to prevent moisture collecting in voids behind the tiles (e.g. external surfaces, bathrooms) notch trowelling may be used in conjunction with buttering. This involves spreading the adhesive on the background and ribbing the surface (as described above) in addition to spreading the adhesive uniformly over the back of the tile. The buttering method may also be used on tiles that have uneven or raised under-surfaces and for vertical surfaces where 100% coverage is vital. A basic thick bed mix is cement & sand in a 1:3 mix for floors and a cement, sand & lime mix of 1:5:0.5 or 1:7:1 for walls. There are two recognized ways of fixing stone using this mix (1) fixing the stone on a mortar bed that is still plastic or (2) fixing onto an already cured bed. Dry-set mortar is a mixture of cement & sand with additives that enhance water retention and is used as a bond coat for setting stone tile. It is typically a single layer 2-3mm thick into which the stone tiles are tamped. Dry set mortar is a factory prepared product to which water is added; it can be cleaned in water. Once laid, it has excellent water and impact resistance and is not affected by prolonged contact with water even though it does not form a water barrier. It is therefore popular for external work. Latex cement mortar is a mixture of cement, sand & latex additives that is used as a bond coat for setting stone tiles. 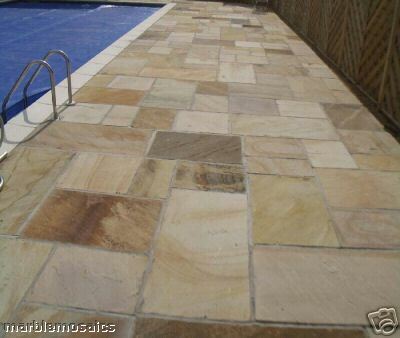 This type of mortar is often used around swimming pools and in shower recesses. Epoxy mortars employ epoxy resin and epoxy hardeners. They are used for sub-floor applications e.g. concrete, wood & ceramic tile. The width of joints varies with the stone; 3-6mm joints are usually used for smooth, honed or polished stone whereas 6-10mm joints are used with stone that has a textured finish. Adhesion installation methods usually require a minimum 6mm joint. Use spacers to achieve neat corners & uniformity of grout joints. Grout is the mortar used to fill joints. Grouting should only commence when the area is thoroughly dry – wait at least 24 hours after tile fixing. Choose a grout colour that will compliment the natural colour of the stone; conduct a small test first to ensure the correct match. Grout can be applied with a pointed trowel, rubber grouting trowel or squeegee. Make sure the grout completely fills the spaces between the tiles to the full depth of the stone tile leaving no hollow cavities that might allow moisture infiltration. Wipe off any excess grout as you go, using a rubber squeegee. Drag a clean damp sponge diagonally over the tiles to prevent the removal of the wet grout out of the joints; wash the sponge regularly in clean water and wring out excess. Leave the newly laid and grouted surface to dry and cure for at least 7 days before sealing or walking on the floor. Sealing stone is usually advisable but not always necessary; it is certainly a good insurance policy for most applications. The science behind sealant formulations has moved with impressive speed in recent years with some of the better sealants able to perform well for up to 15 years, depending on the amount and nature of traffic. As usual, you only get what you pay for and cheap products often have short working lives. There are two basic choices of sealant – surface or topical sealants (that leave a wet look appearance) and penetrating sealants or impregnators that result in no visible change to the look of the stone. Penetrating sealants form an invisible protective barrier below the surface of the stone and act as repellents blocking the entry of contaminants into the pores and cavities of the stone. At the same time they allow internal moisture to escape. Penetrating sealants are used when the natural surface and colour of the stone needs to be preserved. Surface or topical sealants protect the stone surface from staining and provide a coating that helps to preserve the stone finish in heavy wear and high traffic conditions. They will enhance stone colours and provide an attractive, gloss finish that is easy to sweep, clean or wipe. They may also be used on external walls to reduce the risk of damage from graffiti. Before applying sealant, ensure the surface is clean and dry. Apply the sealant with a soft bristle broom or paint brush. Most manufacturers recommend that two coats of sealant should be applied to new surfaces. Floors should be allowed to dry for up to 24 hours before walking on them. Interior stone flooring should be swept regularly with a dry untreated dust mop or soft broom to remove dust and grit. External stone surfaces should be swept and washed with water. Stone floors can be easily cleaned with clean water or neutral (pH 7) cleaning agents; soapless cleaners are preferred as they minimise streaks and film. Mild phosphate free, biodegradable liquid dishwashing detergents, powders and stone soaps are acceptable providing rinsing is thorough. Don’t clean a sealed floor with methylated spirits or ammonia as these products may turn the sealer a milky colour. Dirt and grit are abrasive and may scuff the sealer; mats with non-slip undersurfaces, placed at entrance ways (both inside and out) will help reduce dirt and grit being transported onto the stone floor. Waxing is not recommended as it tends to dull the natural colours of the stone and may discolour the grouting. Refinishing surfaces that are tired or traffic weary can be achieved by honing or re-polishing. Accumulated dirt on external surfaces can often be simply removed using high pressure water with a fan spray head held far enough away to prevent physical damage to the structure of the stone. Scratches in natural stone surfaces are not as big a problem as with other types of flooring (such as cork, wood or terra cotta) where the scratches are often permanent. Superficial scratches on unsealed surfaces can be removed with steel wool, or fine sandpaper. On honed surfaces, use an extremely fine sandpaper or “wet and dry” and work gently along the grain until the scratches are removed; re-seal as required. On sealed surfaces, make sure the area is clean and dry, sand lightly then apply a new coat of sealer to the affected area. Scratches on unsealed surfaces will often disappear with time. In some instances, a light sanding with sandpaper or steel wool will make the scratch less obvious. Surface stains can often be easily to remove using commercially available cleaning products or household chemicals. The secret to removing a more intractable stain is to identify the cause, then apply an appropriate treatment. Sometimes a poultice may be needed; this is a chemical or mixture of chemicals combined with an absorbent material in the form of a thick paste which is spread over the stain with a spatula and left for 24-48 hours. The chemical will draw out the stain into the absorbent material. Organic stains include tea, coffee, wine, food, fruit, urine, bark, leaves, bird droppings etc. These are often pinkish-brown in colour and may disappear once the source of the stain is removed. Clean the stone with 12% hydrogen peroxide and a few drops of ammonia if it persists. A poultice using 12% hydrogen peroxide or acetone may also be effective. Biological stains include algae, lichens, moss, fungi etc. can be removed with ammonia based cleaning products, bleach or hydrogen peroxide or a poultice made up of one of the above. Do not mix ammonia and bleach though – it forms a toxic gas. Oil-based stains such as grease, margarine, cooking oil & cosmetics leave a dark stain that needs to be chemically removed. Clean gently with a soft liquid detergent, ammonia or acetone. A poultice made up of baking soda and water or commercial degreaser may also be effective. Paint stains can often be scraped off with a razor blade or removed with a lacquer thinning agent. Heavy paint stains made need to be treated with a commercial paint stripper. Do not use acid or heat/naked flame on stone. Water spots and rings can be removed with very fine steel wool or sandpaper. Ink stains caused from biros and marker pens can be removed on light coloured stone with bleach or hydrogen peroxide or with lacquer thinner or acetone on dark coloured stone. Marblemosaics Ltd believes that the information contained in this document is accurate but has not checked or verified this information. This document is intended to provide general advice only and has been prepared without taking into account the objectives, problems or needs of the reader. Marblemosaics Ltd has presented this information as a guide only and accepts no liability for any loss or damage caused by any error in, or omission from, this document.